Have a look at your desk. There'll be your computer, stacks of paper (that you'll be getting to shortly), a few pens, a coffee mug. And probably a note pad. Which is probably from some other company. Well we can fix that. Print your own Note Pads today at Red Heeler. Keep one for yourself and distribute the rest to your customers and prospects. Then you can look at your note pad every day, use it to write down to do lists, jot down numbers, plan your day and every time you use it you'll be reminded of your company and how to contact it. Of course, you should already know that. But don't forget that your customers will be doing the same. It's practically a mini billboard on your customers desk. 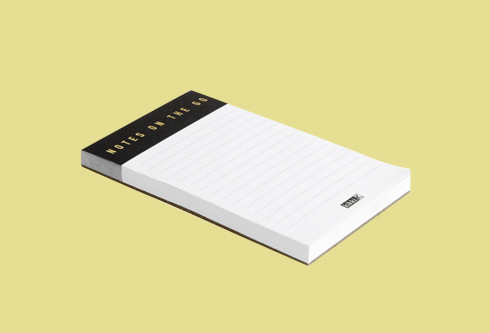 Use note pads effectively and you will get more business. And why else do you spend money on marketing? Get a quote right now and see how much you can save at Australia's lowest price corporate colour printer. And these ones are sourced from fully sustainable paper mills. And cheaper then the recycled ones.